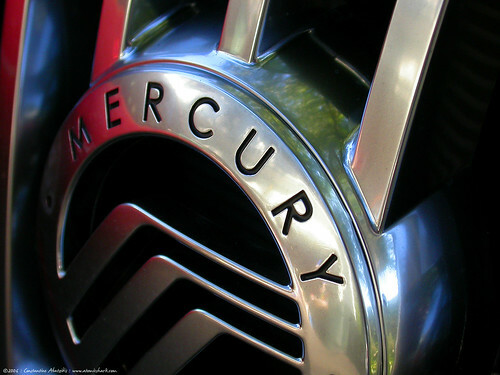 It was announced today that Ford will be discontinuing the Mercury branch at the end of this year, following in the footsteps of Plymouth, Oldsmobile, Pontiac, and Saturn. It is always sad to see a car brand fade into the history books, but in the case of Mercury it is more like finally throwing out the expired milk. Mercury has been an exercise in badge engineering for as long as I can remember and because of this, most likely no one will notice when they are gone. The worse part of the entire thing is that we will not be seeing Jill Wagner on TV nearly as often. The only vehicle I can even think of that wasn’t just a re-badge Ford was the 1999-2002 Mercury Cougar. My sister owned one and for a short while in college while she was in Spain and my Ford Taurus was in the shop, I drove the piss out that thing. It was a hell of a car and a complete pile of crap all at the same time. It had a 2.5L V6, 5 speed manual transmission and it was front wheel so it had massive torque steer, but it was still a lot of fun to drive. One of its fatal flaws, besides having too much engine for the front wheels, was that the alternator was on the bottom of the engine and because the engine was in there sideways you had to nearly remove it to replace the alternator…my sister’s had a bad alternator.The up side to this is with Mercury out of the way, Ford plans to expand the Lincoln brand to seven all-new vehicles with a greater emphasis on luxury. Hopefully this will mean Lincoln will actually start competing with brands like Cadillac, Lexus, and Infinity, instead of just being a Ford with a shinier front grille. This entry was posted on June 2, 2010 at 9:25 pm and is filed under Cars, Failure, Rants. You can follow any responses to this entry through the RSS 2.0 feed. You can leave a response, or trackback from your own site. You certainly are negative about “brand engineering” But you are right. Before Oldsmobile and Mercury became “B.E.” they were actually different. You forgot one of my best cars…Mercury Capri. The original one..that was a fun car to drive.. but go figure it was a German import. The Mercury’s of the 50’s were different. But then Detroit did what Detroit did to cars. Then Ford and GM and Chrysler thrust some junk on us in the 70’s and 80’s But the “C” concept of Lincoln is very interesting and good looking. With suicide doors and all. I think the copy of “c” from c-class Mercedes is funny. Any way now I have ranted on your rant.